MORStakTM Drum Stacker will rack a drum with a drum faucet in place on the drum. 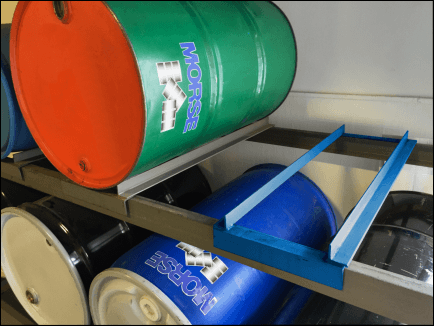 Rack your 55-gallon (210 liter) steel or plastic drum with top rim up to 8.5 feet (2.59 m) high! The material handling solution for safe, efficient drum racking. 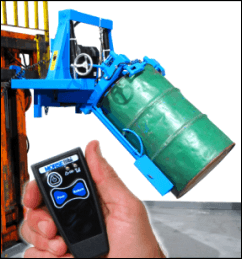 This modern material handling equipment includes powered lift and tilt. Lift your drum, tilt it to horizontal and set it into your drum rack, establishing a safety conscious, efficient 55-gallon drum rack storage system. Model 620-115 MORStak TM Drum Rack Loader shown has battery powered lift and tilt. The MORStakTM drum racker is your material handling solution for safety conscious, efficient and cost effective drum storage and retrieval. MORStak TM drum rackers replace unsafe "bare fork" handling of drums using large, expensive fork trucks. Compact MORStakTM drum rack loaders provide an ergonomic safety conscious way to place drums into and retrieve them from your drum rack. Handle your 55-gallon (210 liter) drum with a drum faucet in place - see diagram. This allows your drum rack to serve as a dispensing station. MORStak TM drum racker has 5" diameter front wheels to fit under the bottom shelf of your drum rack. The MORStakTM drum racker arms fit easily into spaces below the curvature of a horizontal drum on your drum rack. This provides the most efficient use of drum storage space because drums can be racked side by side with virtually no space between them (see rack configuration). MORStakTM Drum Rackers handle ONLY a 55-gallon (208 liter) steel or plastic drum with top rim, and maximum weight of 800 Lb. (363 kg). They will NOT handle a smaller drum or a drum without a top rim. 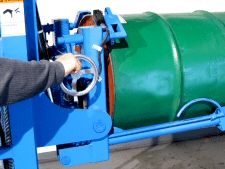 They have a positive drum gripping mechanism that must be manually engaged before lifting an upright drum or tilting a drum from horizontal position. 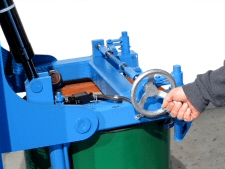 MORStakTM drum rackers will not allow you to tilt your drum without the clamp engaged. NOTE: Morse does NOT make or sell drum racks. We manufacture the Drum Racker. The Drum Pad Kit is included with MORStakTM Models for plastic drum. 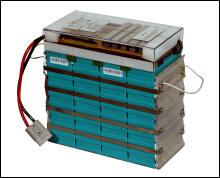 The Drum Pads are designed to support a flexible plastic drum. The Pad Kit allows you to handle a 55-gallon (208 liter) plastic drum with top rim, as well as a 55-gallon steel drum. This kit reduces maximum drum cradle width from 19" (48.3 cm) to 13" (33 cm) for racking a 55-gallon drum. 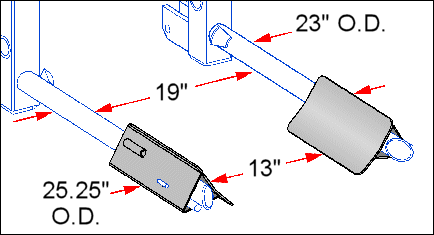 L 60" x W 41"
L 46" x W 36"
Plastic or Steel 8.5' (2.59 m) 900 Lb. (409 kg) L74" W48" H83"
620-114 MORStakTM Drum Racker, Two-stage, Air motor powered hydraulics 985 Lb. 620-115 MORStakTM Drum Racker, Two-stage, 12V DC powered hydraulics 950 Lb. with spark resistant parts 985 Lb. 611-110 MORStakTM Drum Racker, Single-stage, AC motor powered hydraulics 56" (142 cm) 735 Lb. (334 kg) L74" W48" H82"
611-114 MORStakTM Drum Racker, Single-stage, Air motor powered hydraulics 820 Lb. 611-115 MORStakTM Drum Racker, Single-stage, 12V DC powered hydraulics 785 Lb. with spark resistant parts 820 Lb. Drum Racker / Drum Stacker - MORStakTM Drum Rackers rack drum up to 8.5 feet high! MORStak TM Drum Rack Loaders bring ergonomics to drum racking. A safety conscious, efficient 55-gallon drum rack storage system. 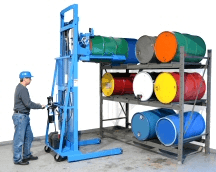 The material handling solution for safe, efficient drum racking.